Photo by Andrew Turner on Flickr and used with Creative Commons license. This piece was originally published by the Donald W. Reynolds Journalism Institute at the Missouri School of Journalism as part of a new RJI series. It is used here with permission. As the news crew at KTVB in Boise, Idaho, has learned, launching their drone for news coverage can draw a crowd. Executive News Director Kate Morris says this has been a good opportunity to educate the public about the opportunities the new technology offers journalists and assure folks of the TV station’s commitment to ethical journalism and safety. But crowds have also posed challenges. Morris says her team has learned that it’s best to have additional staff on hand to answer people’s questions so the drone operators can stay focused on the job at hand. Senior Information Specialist Jennifer Nelson recently visited with Morris about KTVB’s drone efforts. 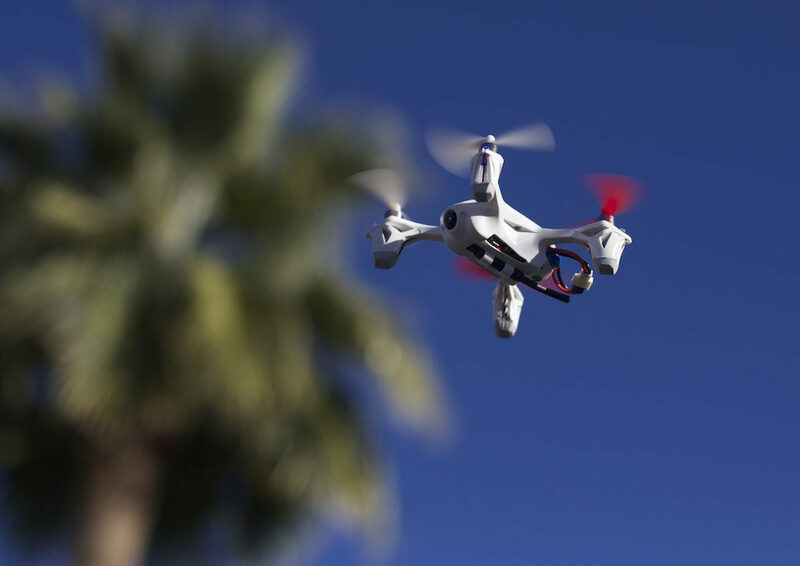 Jennifer Nelson: What inspired you to begin using a drone for news coverage? Kate Morris: I think we’re in a rapidly changing environment for newsgathering and presentation. We don’t have a helicopter in this market. The drone allows us to capture images and perspective we think helps us or allows us to tell better visual stories. What kinds of resources did you need to launch this coverage and keep it going? Morris: We knew that our parent company [Tegna] was working on developing specific protocols for the drone. We wanted to be ready to participate once they were in place, go through Tegna’s program and launch one. We had put aside money in our budget. I want to say our drone, all together with the drone and batteries, was about $10,000. So, there was a bit of planning in terms of buying a high-quality drone that was going to be safe to fly. We didn’t add any staffing but chose two drone champions within our newsroom — two people who are always open to trying and learning new things. It’s quite a process to go through the training. We paid for an online course; it’s not required. We paid about $100 for this course and our two drone champions spent a lot of time studying. Then they had to take the Part 107 certification test required by the Federal Aviation Administration, and that’s about $150 a person. We then participated in a weeklong special drone training program, which was required by Tegna. The two drone champions practiced with each other on operating the drone, operating the camera and communicating with one another; as well as paying attention to what was in the sky. They went through a really thorough process before we even launched. In order to keep it going we have to make sure we fly regularly. Those two drone champions must keep up with their education and FAA requirements. They must take meticulous care of the drone. There are certain checklists that they review to take care of all the parts. They do regular maintenance on the drone like you would your vehicles. There’s quite a checklist when your number one priority is safety. What goes into planning and executing a successful drone shoot like your coverage of the McCall Winter Carnival? Morris: We had to secure a location — a roped off area in this case — to safely put up our drone. We alerted the FAA and kept in contact with airport officials to ensure air safety. Weather was a major factor that day and nearly prevented us from putting the drone up. We are carefully monitoring conditions including temperature, wind and visibility. How do you decide what stories to use the drone for? Morris: Everyone is super excited about the drone in the newsroom. A lot of folks say, “Let’s go put the drone up.” It’s not as simple as putting the drone up because our number one priority has to be safety, so it depends on weather conditions. You can’t fly a drone for a weather story if it’s too windy or rainy. There are so many different things we have to factor in before we put it up. That isn’t to say we haven’t been able to use it day of coverage. We do have special waivers where we can put it up pretty much anywhere in our DMA, as long as we’re not right next to the airport. We just have to make sure that we go through our checklist and that safety is our first priority. Then the drone is something we’re able to use. It’s not something we’ve used on a whim or for every single instance. But if it makes sense, then we put it up. We put it up recently for a court story. We just got drone footage of the Ada County Courthouse here in town. It was visually not an exciting story otherwise. How’s our snowpack so far? Knowing what you know now, what would you do differently if you were going to launch the drone today for the first time? Morris: I would say the hardest part is being able to operate the drone and communicate with your partner. I would recommend as much practice time before a live launch as possible. We chose to launch at a big community event. As you might imagine, that drew a really large crowd. A lot of people who were curious, had lots of questions. I would have someone on standby just to do crowd control and Q-and-A because that instance to us was very distracting for our operators. Fortunately for us we had other staff out there that could come help but it was a little bit distracting. I would make sure you have people there who are very knowledgeable about the process that you put in place, someone who just answers basic questions. It sounds like you have more than one drone operator at a time. Why is that? Morris: FAA requires that there be at least two people operating a drone for commercial use. One is a visual observer, the other is the remote pilot in command. This allows us to make sure the drone is operating safely, not flying over people, or in the direction of power lines and so forth. You had mentioned that one of the hardest things is for the drone operators to communicate with one another. Why is that? Are they in different locations? Morris: The operators are near one another. Eyes must be on the drone at all times. The drone operator and camera operator must communicate to make sure someone has their eyes on it. I think in the beginning it’s a learned process of how to work together. This becomes easier with time and practice. How have viewers responded to the drone and the coverage it has provided? Morris: I think people have responded really positively. We’ve gotten really great comments and compliments. Lots of talk about the drone. People think the footage looks great and they’re very impressed with that. Our latest drone shoot received over 200,000 views between Facebook and YouTube. It was of Shoshone Falls. I will say that every time we put the drone up we’ve had people comment about and ask questions. At least one person is always concerned about what we’re taping and privacy. What we’ve tried to do is be super transparent and overly communicative on air but then also in person. We’ll step down and show them our licenses and waivers. We’ll explain to them exactly how it works and work to reassure people. We also remind people that we’ve had telephoto lenses for decades. We don’t spy on people in their backyards or peer through windows with our telephoto lenses. We could go on top of a building and shoot down to street level. Our goal is not to invade privacy. We operate under the same journalistic standards of integrity that we do with our regular cameras. So for me, ultimately, it’s about building trust through transparency. Do you plan to continue to shoot drone footage and, if so, what’s next for the drone? Morris: Yes, absolutely. We plan to update all our marketing footage. We’re talking about going out and shooting a lot of scenic shots around our DMA and using that as daily show closers. We’ll be using it for several sweeps pieces coming up this month to kind of give people a different perspective and enhance our storytelling. We’ll also continue with day-of coverage as it makes sense because, as I mentioned, safety is our number one priority and we take that responsibility very seriously. You can contact Kate Morris for more tips by sending an email to [email protected].